Announcing the winners of the twentieth ever Right Place Photo Caption Contest! 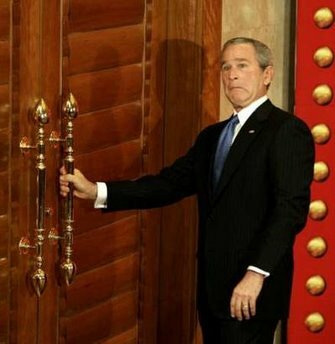 #12: President Bush reacted to a sudden burst of noise emanating from behind the door. It sounded like Tom Cruise, John Travolta, and R. Kelly, all singing "Trapped in the Closet." #11: "Sorry there, cowgirls! Uh... where's the little cowboys' room?" #10: "Michael Moore forgot to flush in there again." #9: "Don't go in there! The Three Tenors are having a fart contest!" #8: Although his John Kerry impression was hailed as "hilarious" and "dead-on" by his friends, President Bush finally discovered, much to his dismay, that his grandmother had been correct when she warned that his face might one day freeze in that position! #6: "Alright, I'm gonna give you press people to the count of ten to clear out, then I'm gonna release Rumsfeld - and you might be interested to know that we haven't fed him for three days!" #5: Trying to avoid his father's Asian faux pas, Bush runs for the door, only to find it locked! #4: "Orders are -- nobody can see the Great Oz! Not nobody -- not nohow!" #3: Bush realizes there may be something to this "exit strategy" talk after all. #2: President Bush discreetly backed out of the conference room after inadvertently coming across Congressman Murtha demonstrating his "rapid pullout" stategy to Nancy Pelosi. #1: Due the many practical joke devices made cheaply in Asia, the President fell victim to the old "electrified door handle" gag. Chris has another very funny photoshop entry to share this week. I will again caution those of you who may be easily offended, but the rest of you can see it RIGHT HERE. Here are the overall rankings for the first 20 caption contests!! !